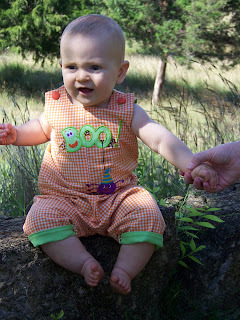 One year ago right now I was on "pins and needles" wondering if we would be able to make it to Stillwater in time for the birth of our first Grandchild. 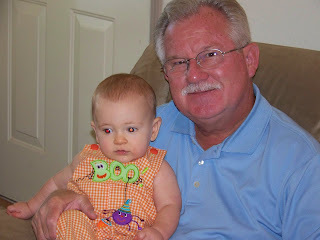 The good Lord saw to it that we were there by having Bridget's Dr. feel it best to induce her, due to high blood pressure. We arrived the evening of Sept. 30th and Bridget was induced on the morning of Oct. 2nd. 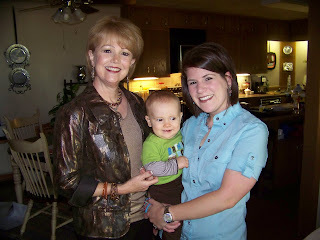 Becoming a grandparent is all that I had heard it would be and more. 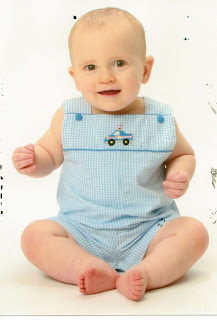 I would have never dreamed that I could feel the love in my heart such as I felt when our own children were born, but let me assure you, the love was full to overflowing when I laid my eyes on that precious little Grandson. 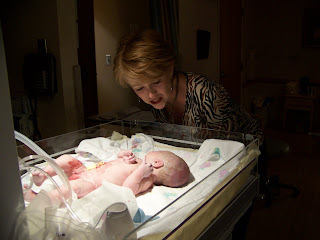 The nurse's remark when I took my first look at Clancy was, "I think we're witnessing a Grandmother being born." For sure!! 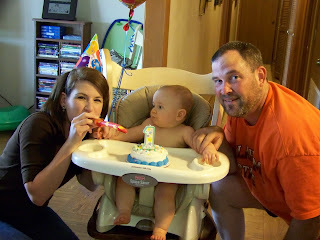 This past week-end we had the joy to celebrate Clancy's first birthday. Yes, I'm well aware that he has no idea that he is about to be one year old, but, none the less, I feel sure he is well aware of how much he is loved and how much we enjoyed celebrating his first year of life. 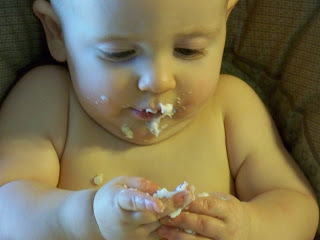 Clancy wasn't exactly sure what to do with his cake, but after his Daddy cut a small section out for him, he realized that it was okay for him to dig in, and he did. 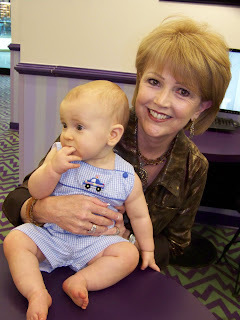 It is the desire of my heart to be a Grandmother that my grandchildren will always enjoy being with and making memories. But, more importantly, that they will see the love of God in my heart and life and know the greatest desire their CiCi has for them is to know and love God and accept Him, and be all that He intends for them to be. 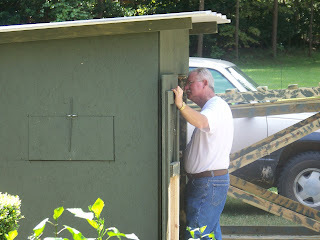 I know that many of my "faithful blog followers" have been waiting with baited breathe to see the Hyatt Deer Stand put together and in it's "rightful place" in the woods. So, here you are! Tommy gave up on hopes of it not raining and things drying out and just decided that he and some "strong backed" buddies would "brave the elements" and take it on up there today. 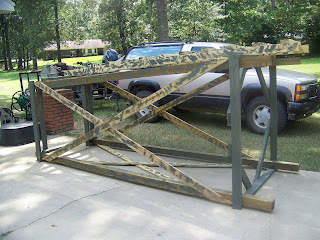 All went as planned and the stand is "waiting and ready" for deer season to begin. 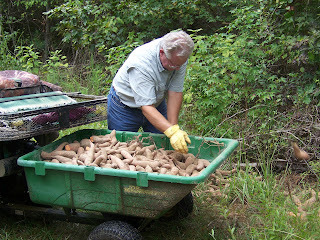 After he showed me the stand, we went to take a load of sweet potatoes and spread them around to feed the deer and get them ready for the season. 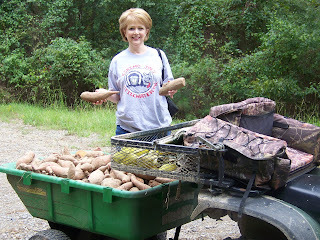 Tommy has never fed the deer sweet potatoes before, but had heard from hunters that did, that is was a worthwhile endeavor. 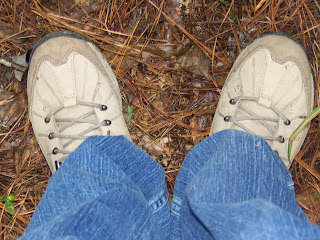 So, off we went on the 4 wheeler through the woods and mud holes. It really was a fun outing and gave me more insight into the "art of hunting" and the enjoyment that it brings Tommy, and we made a memory! I bought these shoes two years ago to take on our Alaskan Adventure and knew that they would likely come in handy at some point after that. Today was a day that they were definitely handy. I prefer "prissy, stylish" shoes, but those just will not work for some things. Besides that, I feel like a "real woman" when I put these on! Work Out your difficulties with others. Slow Down and be gentle. Remember that "God is Near." Let Go of all your anxieties. Hand them over to God. Allow God's peace to guard your heart and mind. Focus on the positives of life. Do what you already know you should do. Be content with whatever situation you are in. Claim the promise that "I can do everything through Him who gives me strength." Accept the help and encouragement of others. Trust god to meet all your needs. Give God all the glory. 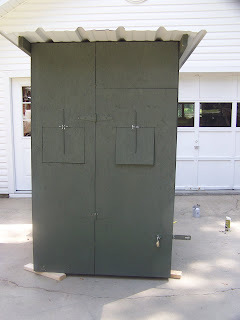 I know, the above picture looks very much like an "outhouse." 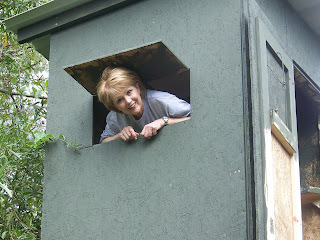 But, let me assure you that it is not, it is the top to a "first class" deer stand. 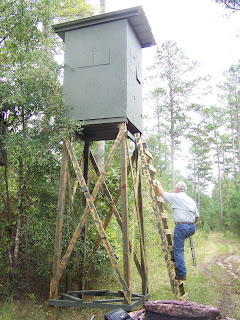 Over the course of 38 years of marriage, I've seen deer stands evolve into small Hyatt Hotels. *smile* Tommy spends hours drawing out plans, getting the materials and then painstakingly building his "home away from home" for the duration of deer season. When he has the top built, he then builds the stand to place the "hotel" on. His measurements have to be exact so that when it comes time to put the two together, they will fit perfectly. Of course, they are not put together until they are both carried to the woods. There would be no way to haul them to the woods if they were together beforehand. 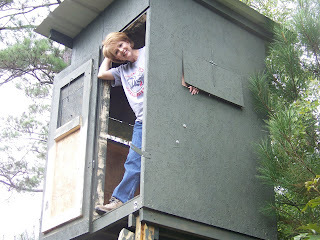 I have never been a part of the "raising" of the deer stand and don't imagine that I ever will be. It is a very intense endeavor and safety is of utmost importance. Safety has always been a top priority for Tommy and I always know that he will be extremely careful in setting up the stand. He gets an able bodied friend to assist him and off they go. Inside these hotels (he has about 4 of these stands) are a very comfortable chair, portable heaters, and carpet. He carries a backpack with all kinds of "good eats" and between eating and napping, he finds time to do a little hunting. No, I don't understand it at all and nothing about it seems enjoyable to me. But, I think everyone should have a hobby that brings them enjoyment and I feel sure that Tommy would say this is one of his most enjoyable hobbies. For me to get up way before daylight, drive miles up into the woods, and sit in a deer stand and be quiet would be the ultimate form of misery. *smile* But, I bet Tommy would say the same thing about some of my hobbies, such as blogging. I'll have to do another blog about this years season when it is over. I know you can't wait! There has been a "nip" of fall in the air this week and it caused me to begin thinking in that direction. 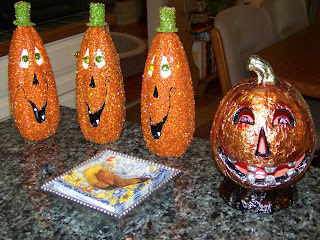 So, today I decided I would do a little fall decorating. Well, might you know, it was a very hot and humid day and anything but "fall like." But, I had made my plans and I went forth with my decorating. I am so glad that I live in an area that "celebrates" all the seasons of the year. I cannot imagine living where there is virtually no change in the seasons. How boring!! My favorite seasons are spring and fall. I just do not find winter and summer all that exciting. 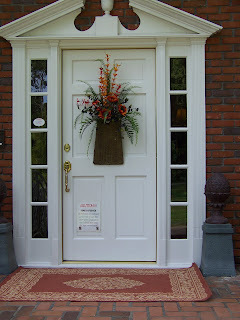 In the spring I think of bedding plants, decking out the patio and a "fresh start." In the fall I think of pumpkins and mums, all the cute little ghosts and goblins at Halloween and the beautiful colors of the trees. God "shows off" His creation the best in both spring and fall. I use to do a whole of decorating on the inside of our home, but in recent years I haven't done as much. I guess I've grown tired of pulling it out and putting it up. But, I still enjoy a small amount of inside decorating for the seasons. 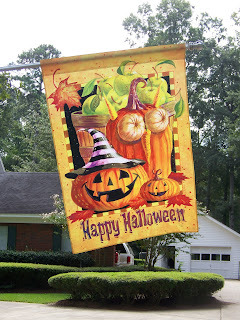 Yes, we are "decked out" and ready to celebrate fall and all of the exciting things it holds in store for us. A happy fall to each of you and take time out of your busy schedule to enjoy His handiwork.